Sign up for a Student Oyster card online or at your college or university and get up to 30% off the cost of your travel cost in and around London. For £10 only (the cost of buying a 18+ oyster card for students - was £5 in 2008/2009), you save a third on the cost of travelling on buses, London underground trains, Dockland Light Rail, some routes on Over ground trains, trams and eligible river boat services within the M25. It is the way to go to make your student budget stretch further. The average living expenses for students studying in London is estimated to be about £850 per month, and it is believed that transportation and travel expenses could easily gulp a whooping 10 to 15 percent of this (£85 to £130). Just think off the savings a student oyster card could bring you. You can also sign for a student oyster account if you are a student with compulsory work placement in and around London, taking you through London, even if you do not study in London. If you have an online account, then log on straight onto your account online . Look for the link to report lost or stolen cards, and fill in the required details. Remember to recall the security question you saved when you were opening your account. This will enable you to stop others from using your card immediately, as well as get a refund for the balance on your card, or even an outright refund of the balance to your credit card. If you have no online account, do not worry either. Call the Oyster Cards Helpline on 0845 330 9876 between 08:00 and 20:00 Hours and report this. You will be able to cancel your old card immediately, and then get a replacement ticket if you want, or get a refunds of the balance on your card to your new card or back into your bank account or credit card. If the lost occurred out of 08:00 to 20:00HRS, then why not go online and long on to report such, following the link as in option 1 above. Provided you remember the answers to your secret questions, you should be able to proceed. 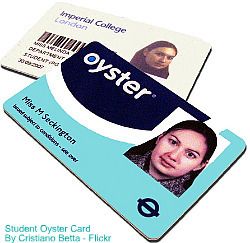 The best way to protect your Student oyster card is to register for a free online oyster card account here .